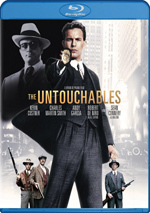 One of HBO’s signature shows, this one-hour drama chronicles the life and times of Enoch “Nucky” Thompson (Steve Buscemi), Atlantic City’s undisputed czar at a time when Prohibition proved to be a major catalyst in the rise of organized crime in America. Picking up 16 months after Season 2 ended, Season 3 begins on New Year’s Eve 1922-23. The Roaring ‘20s are about to start; though the economy is booming, alcohol has become scarce, competition is fierce, and gangster violence is heating up. 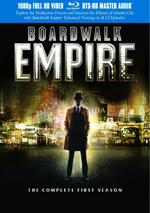 Amidst this backdrop, Nucky, whose marriage to Margaret (Kelly Macdonald) has become a sham after she signed away his highway windfall to the church, faces new competition in the person of Gyp Rosetti (new cast member Bobby Cannavale), who builds a new strategic bulkhead between New York and Atlantic City in an effort to siphon off Nucky’s alcohol business. The conflict brings out the best and worst in Nucky, who proves his brutal mettle in a series of violent encounters – including a climatic facedown with Gyp in the Season 3 finale. 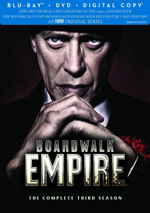 New and familiar faces also undergo compelling metamorphoses as the 12 new episodes of Boardwalk Empire unfold. 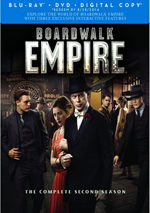 One of the more praised and successful on-going cable series, Boardwalk Empire comes back for its third season. This Blu-ray includes all 12 shows from that year, and the synopses below come from the package’s menus. Given that S3 starts a fair amount of time after the finish of Season Two, you can expect much of “Resolution” to simply bring us up to date. That doesn’t mean it offers basic exposition and nothing else, but it does lean heavily on updating. That’s not a bad thing, and “Resolution” does introduce a major new character via Gyp, a gangster who seems eager to encroach on Nucky’s turf. Add to that a few other developments and “Resolution” opens the season in a satisfying manner. Has Margaret always been such a drag? Probably, and I understand the series needs characters like her; it’d become monotonous if it simply focused on colorful gangsters all the time. Still, every time she appears on screen, I can’t wait for her to leave. That becomes especially true given the fun generated by our new character Gyp, a lowbrow guy with a fiery temper. Even with the Margaret scenes, “Coffee” works pretty well, as it moves along the narrative. Rather than deliver concrete plot developments, “Tuna” tends to hint at events to come. We see Gyp’s affection for Gillian and sense that’ll lead somewhere in future shows, and Nucky’s continued inability to sleep haunts him in a manner that also implies more substantial material down the road. Probably the most fun comes from Van Alden’s uncomfortable life as a door-to-door salesman; I don’t know where that thread will lead, but it’s a hoot to see the uptight Van Alden forced to attempt to fit in with the boys. As much as I hope Margaret will someday turn into an interesting character, it seems less and less likely over time. At this point, all I wonder is if she and sassy Doctor Mason (Patrick Kennedy) will launch the affair that feels probable. On the more positive side, we finally meet the notorious Roland Smith, and he offers surprising charm. A few other elements get a bit more interesting as well, but overall, “Bell” seems a little lackluster. Perhaps I shouldn’t harp on how dull I find Margaret to be, as I’m starting to think Empire simply can’t figure out how to give us interesting female characters. Actually, Lucy was exciting when she was around, but she’s long gone now and her female successors have been forgettable. Gillian fails to present much personality, and Billie – essentially Nucky’s new Lucy – is a dud as well. Because “Surprised” becomes more female-centric than usual, this turns into a problem. As I mentioned earlier, I understand that the series needs some of these roles to avoid monotony, but I still think Empire could find more compelling female characters. Those elements mean “Surprised” tends to drag more than I’d like, though it still musters a few good scenes, such as one in which Chalky White subtly encourages Eddie Cantor to do Nucky’s bidding. Because Richard has always been one of the more intriguing roles, it’s good to see him receive an expanded part. That adds to an episode that also boasts fun twists related to Nucky – twists that manage to overcome the dull Margaret-based moments. With the Easter setting, family elements come to the fore here, so don’t expect as much business as we’d normally find. That makes the show less eventful than usual, but it does help develop the characters and relationships to a reasonable degree. It’s a bit on the slow side but manages some useful developments. You know what’s worse than Margaret scenes? Margaret scenes that explore her tedious affair with Owen Sleater. Eep – I know that thread was inevitable, but that doesn’t mean I have to enjoy it. “Pony” comes with quality sequences to counteract Margaret/Owen, though. It’s a treat to see Buscemi with Cromwell, and the Van Alden sections fare especially well, as Michael Shannon finally gets to cut loose. Honestly, of all the character threads, none go into as many surprising places as Van Alden’s, so an episode in which he plays a prominent role almost automatically becomes a good one. At the risk of throwing out a spoiler, “Pony” ends with a major event and its repercussions reverberate through the exciting “Lot”. The season has been building toward a showdown between Nucky and Gyp, and “Lot” helps push in that direction. Throw out additional issues connected to more of Nucky’s rivals – as well as his increasing mental instability - and “Lot” cranks along well. After the grand drama of the last show, “Plan” brings things more into “simmering pot” territory, as it focuses on set up for the finale. Not that nothing eventful occurs, as we find some important changes, but most of the program feels like a way to move us toward the finish. In that regard, it does well for itself and makes me look forward to the final two episodes. Part of the fun we get from “Impostors” comes from the way it ties together threads that seemed unconnected through the season. To reveal more would enter spoiler territory, so I’ll leave it alone. Suffice it to say that “Impostors” shows the links well and creates a strong episode. “Sands” starts with possibly the longest sequence of violence in the series’ history, and that acts as a good declaration of intent. Matters calm down from there, of course – we don’t get an hour-long bloodbath – but the drama remains at an elevated level, and plenty more action ensues. Along with a variety of twists and turns, this becomes a terrific conclusion to the year. How does Season 3 compare to its predecessors as a whole? Pretty favorably, I’d say. Sure, it drags at times – primarily due to those tedious Margaret elements – but it develops a good mix of elements that all come together by the end. Season 3 shows a series that just keeps on chugging. Boardwalk Empire appears in an aspect ratio of approximately 1.78:1 on this Blu-Ray Disc. If you saw the first two seasons, you’ll know what kind of visuals to expect from this one. As always, sharpness was good but a bit inconsistent. This meant some wide shots tended to be a little soft, which I figured was a combination of the cameras used and the photographic style desired. Whatever the case, overall definition seemed positives, so the softness was mild. No issues with jaggies or moiré effects occurred, and edge haloes remained absent. Don’t worry about print flaws, as they failed to appear. Like most period pieces, Empire opted for a subdued, fairly sepia look. More prominent hues appeared at times, but the general impact remained a bit desaturated. Within those parameters, the colors seemed well-rendered, and blacks looked pretty deep. Shadows showed nice clarity for the most part; a few were a bit dense, but those weren’t a big issue. Season Three gave us perfectly acceptable – and often superior – visuals. Lather, rinse, repeat when it came to Season Three’s DTS-HD MA 5.1 audio. Like prior years, the series tended to be fairly dialogue-oriented, so much of the material remained environmental. Nonetheless, the occasional action sequences brought the mix to life in a fine fashion, as those used the spectrum well. This mainly meant lots of guns and explosions, all of which presented appropriate bang for the buck. In terms of audio quality, the track satisfied. Music was rich and full, while speech appeared distinctive and natural. Effects showed positive delineation, as they boasted clean tones and nice impact. Bass response appeared taut and delivered a good punch at the right times. As was the case in the past, the audio lacked the ambition for a high grade, but the material seemed worthy of a “B”. “To the Lost” - Winter, Van Patten, Cannavale and actor Chris Caldovino. Across the various tracks, we hear about cast, characters and performances, sets and locations, period details and historical elements, themes and story elements, and other areas. Like the commentaries for prior seasons, these have their ups and downs. I think the best come with “Resolution” and “Impostors”; the former sets up Season Three well, and the latter gives us the richest examination of a particular show, mainly via Coulter’s insights. “Surprised” probably fares the worst, as it tends to come with a slow pace and not much data. The rest are all decent to good, so the bunch remain worth a listen. Expect inconsistencies, though. All 24 of those “Newsreels” will also appear on Disc Five, so I’ll discuss them there. For the time being, I’ll focus on the “Characters” and “Locations” aspects of “Chronicle”. S2’s “Character Dossiers” fulfilled a similar purpose and proved to be useful. The same holds true for “Chronicle”; it’s an efficient and unobtrusive way to avoid confusion through the episodes. Disc One provides a featurette called Distilling Season 2. Hosted by Terence Winter, this 14-minute, 22-second piece gives us a quick overview of the series’ second season. It’s a nice refresher, as it gets us back up to date before we launch into the third set of shows. On Disc Five, we get the bulk of the extras. American Empires offers an interactive feature that promises to let us “get a closer look at America’s Prohibition-era gangsters”. This means a mix of text, photos and maps to let us learn more about the real-life figures and situations that influenced the series’ drama. “Empires” provides a surprisingly rich overview and gives us a lot of good notes. Alluded to earlier via the “Boardwalk Chronicle” feature, Newsreels includes 24 individual featurettes. Via the “Play All” button, these run a total of one hour, two minutes, five seconds and provide notes from Winter, Korder, Flappers and the New American Woman author Catherine Gourley and researcher Ed McGinty. The “Newsreels” examine at historical elements/personalities related to the series’ era and how these facts connect to the show’s characters/situations. These move at a brisk pace as they mesh history and fiction in a satisfying pace. I like the “Newsreels” a lot, as they bring us a very nice elaboration on the series’ narrative. In the 29-minute, 56-second Director’s Chair, we hear from Van Patten and Coulter. They chat about the season’s visual look, themes, their approach to the material and how they mesh their respective episodes, and specifics about aspects of S3. Occasional notes repeat info from the commentaries, but “Chair” still works well, especially via the analytical way the directors reveal the techniques they utilize. Scorsese on Season 3 lasts four minutes, 34 seconds, and offers the filmmaker/series executive producer’s thoughts about the series and changes for S3. Scorsese tends toward generalities and tells us little of value; honestly, this feels like a promo piece. During the four-minute, 57-second New Characters, we hear from Winter, Steedle, and actors Arron Shiver, Michael Zegen and Stephen Root. As expected, they talk about roles and actors who debuted during S3. A few decent notes emerge but this is a fairly fluffy featurette. The set also includes a DVD Copy of Season Three. This gives us the episodes alone without any extras. After two good years, Season Three of Boardwalk Empire continues the series’ solid run. Maybe eventually it’ll sag, but so far it remains involving and engrossing. The Blu-rays provide generally positive picture and audio along with a nice set of bonus materials. Fans should find more of what they like from S3.